Stone facade provides a distinctive alternative to glass and metal curtain walls. Distinctive pinks, reds, greys, and blacks of polished granite and the white, buff, and green of marble along with the black and blue of slate are appearing on the urban skyline. 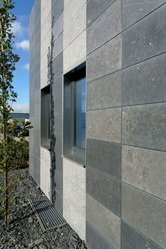 Stone cladding popularity has increased to such an extent that major glass and aluminium curtain wall manufacturers have adapted their systems to accept stone inserts. Angles, straps, anchors, and wire ties are common methods of stone erection subject to individual design considerations. New methods have been developed to cut natural stone more precisely and quickly. 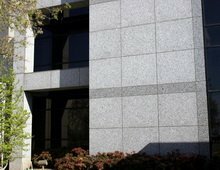 Because stone is a product of nature with inherent variation in physical properties, proper selection of material and its preparation as a cladding system requires careful evaluation. Stone can be finished in a variety of ways. It can be polished, honed, rubbed, flame or thermal finished, or retain the natural swan appearance. Not all ranges of finishes are applicable to all types of stones. The wide range of finish choices applicable for dense stones such as granite diminishes to a limited choice for soft stones such as limestone and sand stone. There are four primary types of veneer attachment to the building exterior. Two are installed piece by piece on site, while the other two types are fabricated offsite and installed as integral panels. In the conventional piece-by-piece stone facade system, the stone is installed either by using relieving angles, strap anchors, dowels, and mortar or by other mechanical systems. The standard set method is done over masonry back up with stone panels set against Portland cement spots. The mechanical system utilises a metal grid attached to the structure. The stone panel is retained by angles fitted into slots cut into the side of the stone. It is important to note that non corrosive metals must be protected from electrolytic reaction. In the prefabricated system, panels are attached off the job site by specialty contractors. The stone is lowered, finished face down, into prepared forms. Stainless steel anchors are placed into precision drilled holes on the back of the stone. The location and amount of anchors used are functions of the spanning capability of the stone. A bond breaker such as a liquid applied membrane or a sheet of polyethylene is laid on the back of the stone prior to concrete pour. The purpose of bond breaker is to accommodate differential movement between the stone and the concrete backup. After the concrete has cured, the panels are trucked to the job site, hoisted into position, and secured to spandrel beams and columns. Try construction specification institute for info. Another method of producing pre fabricated system is to fasten stone pieces directly on to steel trusses. Yet another system is obtained fastening a fibreglass mesh Portland cement backing board to the truss and attaching the stone by using the mortar method. In the first system the stone is secured to steel by fitting metal angles into slots at the top and bottom of the stone panel. A stone facade system that is finding more and more application in high rise buildings consists of an aluminium curtain wall system into which stone veneer is slipped instead of glass panels. The pre cut stone veneer is simply slipped into what would otherwise be aluminium window frame.